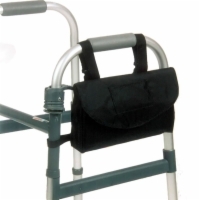 A1 Medical Supplies has several types of bags designed to add storage capacity to your rolling walker. 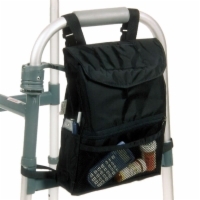 Don't let a purse or backpack throw you off balance - let your walker do the carrying for you! The Side Walker Bag is a one pocket bag that attaches to the side of your rolling walker and can store smaller items. Size: 11" x 6" x 3"
The Deluxe Walker Bag has six pockets to store a wide variety of your belongings in an organized fashion. 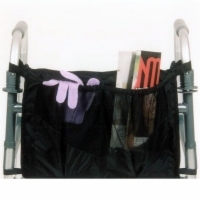 Can hold books, magazines, etc. The Front Walker Bag is a three pocket bag. One large pocket in the back and two mesh pockets in the front keep your personal possessions organized.